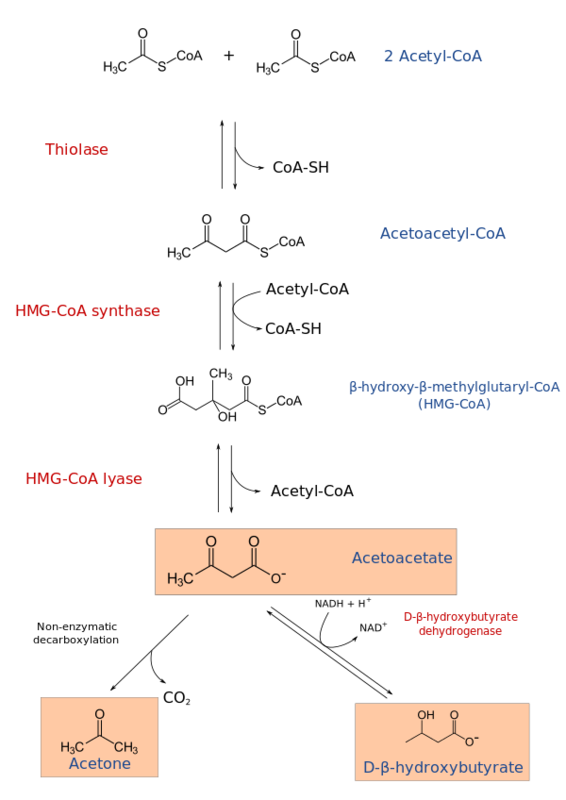 Does Ketogenesis take place in the setting of low glucose levels in the blood, after exhaustion of other cellular carbohydrate stores? Ketogenesis, the breakdown of fatty acids via oxidation, occurs when blood glucose levels are low and cellular carbohydrate stores have been used up. The fact that ketogenesis replaces glucose as a fuel allows the process to help you survive if you’re deprived of food and carbohydrates. The key to understanding this is to familiarize yourself with the way that the body converts different compounds into fuel that your cells can use. Glucose, or sugar, is your body’s major fuel supply. When you eat a combination of fat, carbohydrates, and sugars, your body uses carbohydrates for energy first. This is called glycolysis. Unused sugars are stored in the muscles and the liver. Fat is used next through a process called lipolysis. Lipolysis requires oxygen for the breakdown. Therefore, the body will attempt to convert glucose into energy before it turns to your fat stores. Fatty acids are mobilized after the body has used most of the glucose from all available sources. At this point, ketogenic channels in the liver are activated. Protein can be converted into glucose to power your brain and body, but relying on this process, which is called Gluconeogenesis, can cause you to lose lean muscle mass. Ketogenesis is similar to lipolysis. Healthy people who consume a balanced diet will undergo lipolysis regularly as the body burns fat for fuel. The amount of ketones produced under normal conditions is negligible. When you don’t take in enough carbohydrates, you shift into a fasted state. It takes about 18 to 24 hours to drain glycogen stores. After that, most bodies rely on gluconeogenesis for fuel for the next two days or so. Researchers are able to deduce that the body is fueling itself via gluconeogenesis by measuring the amount of nitrogen in the urine. Within 2 to 10 days of fasting, the body goes into a protein conservation stage. At this time, ketogenesis intensifies as the liver continues to convert fat into a usable source of energy during periods of glucose deprivation. The ketones spill into the urine. Individuals can test their urine to determine whether their bodies are in a state of ketosis. Glucose is usually the primary energy source for the brain. Your brain can’t store this nutrient and needs a constant supply. If you don’t take in enough carbohydrates or burn them off to depletion, the ketones produced through ketogenesis will stand in for glucose as brain fuel. Because ketogenesis occurs in the absence of glucose or carbohydrates, it can be activated by a few factors. Consuming a limited amount of carbohydrates can force the body into ketosis. So can fasting. Scientists have tested this by injecting subjects with compounds that speed up glucose metabolism to stimulate ketogenesis. Insulin is related to glucose and can interfere with ketogenesis. When you eat carbohydrates, your blood sugar levels rise. Your pancreas secretes insulin, which helps move the glucose from your bloodstream into your cells to be used as fuel. As this occurs, your blood sugar levels decrease, and insulin production slows down. If you eat too many carbohydrates on a regular basis, your pancreas might flood your system with insulin. Over time, your body becomes used to this level of insulin and doesn’t respond as swiftly. Your blood sugar and insulin levels remain high. Insulin encourages your body to store glucose as fat. High levels of insulin prevent ketogenesis because you’re storing fat instead of metabolizing it. Most people only have excess insulin when they’re diabetic, insulin resistant or undergoing insulin therapy. However, in the first few days of food restriction or a ketogenic diet, you might have higher insulin levels than normal as your body tries to mediate its fuel efficiency. Lowering your blood glucose levels, reducing the secretion of insulin and avoiding foods that are high in carbohydrates can help you to continue to operate on a ketogenic level, burning fat instead of sugar for energy. Increase Ketones Naturally | 6 Hacks You Can Do Today! Do Exogenous Ketones Help with Keto Flu? Get The Essential Keto Cookbook Free! Get one of my favourite Keto Books 100% for free! 100+ Keto recipes including breakfast, appetizers, entrees, desserts, drinks, and snacks. All you have to pay is shipping. On for a limited time only.